I was curious about something I saw in an article about a historical computer, and while the problem has mathematical aspects, it seemed at the time that Retrocomputing SE was a better choice than Math SE or SO, so I asked here. What I've received so far includes what I'd call a "what's wrong with the OP" (the part that suggested I should start "thinking" was edited from a comment within the five minute window, but added to a later comment instead), as well as what's wrong with the BBC. Then it was suggested I consider paying for two hours of the users time! My understanding is that posting an answer is completely voluntary. I wonder how this whole page would fare being passed through the "snark detector", would my comments register as well? I'm asking because it would be fun to ask more questions here if I felt welcome. Our users have always been really great at flagging and removing outright abusive comments, but we’ve long struggled to deal with (or even define clearly) lower-key unpleasantness: condescension, snark, dismissiveness. We just finished our first step to change that: 57 employees provided 13,742 ratings of “fine,” “unwelcoming or snarky,” or “abusive,” on random comments on SO, and we’ll be sharing the initial results and our next steps in a separate post. TL;DR: I think the comment was justified, though not a great idea to post. Your use of the word "Wikipedia" shows that you knew exactly what Raffzahn was referring to here (or were at least confident). Also, this comment implies that you know which article Raffzahn is talking about, so there was in fact no need for clarification of any sort. Your use of the word "reflexively" to describe Raffzahn's motivations suggests (regardless of your intent) a lack of thought on his part, and the phrase "just because it doesn't mirror a Wikipedia article" puts forward a rationale that is commonly considered a sign of poor research (the old adage "Wikipedia is not a primary source, and you should not use it" pushed by school teachers interested in teaching the ability to perform research) that Raffzahn didn't even have... for a claim he didn't even make. In short, an eloquent straw man: something that should not exist outside of polemic debates. You could have genuinely misinterpreted what Raffzahn was saying, but that's stretching a bit thin now. This seems a little sarcastic. Personally, I think that Raffzahn was justified in saying this. Though it was still not the right thing to do; a custom flag for moderator attention explaining what was happening would have been a better action. If I were in this situation, I probably (~70% likelihood) would have done the same as Raffzahn did, despite it not being the best way to diffuse the situation. If I had noticed that it was an issue of moderation, however, I'd have flagged and left it to one of my fellow moderators to deal with. Putting on my paranoid hat, it's much easier to interpret your actions as malevolent than benevolent. You posted messages that seem designed to provoke a reaction, dropped a link to an SO blog post (and in doing so, basically saying "authority figure says don't argue back"), covered your back whilst throwing another punch ("And yet I don't give much importance to that, or think that it calls the rest of what you've written into question. "; implying that Raffzahn was criticising your question) and then posted an out-of-context comment on meta to try to get people on your side. You almost certainly weren't doing this... but other people don't live inside your head. We don't know what your intentions are. So, and this goes for everybody, be nice. The question is about being welcoming to new users, so I'll address that. Based on a read of most of the comments and another answer there, people found my question to be interesting and took time to explain several aspects of the subject to me. It was my first question here and overall the experience was quite welcoming! Talking with strangers over the internet is a new thing and humans are just starting to learn how to do it. 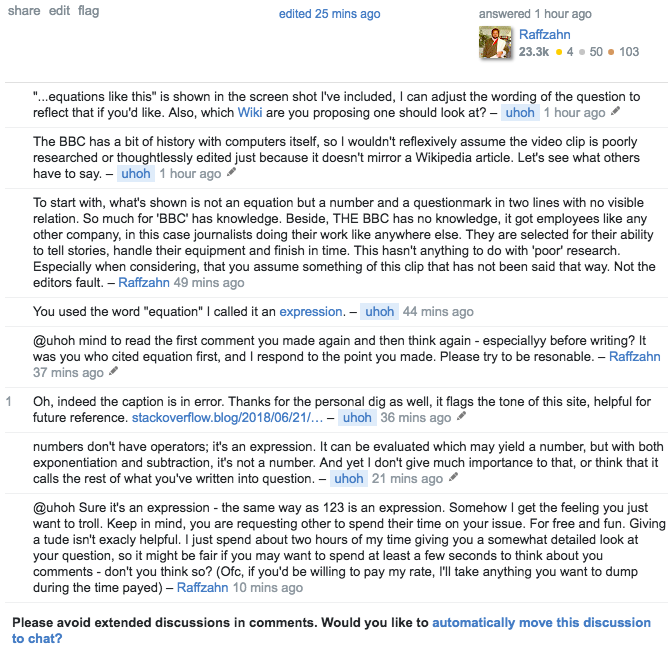 While computer gaming has given us the skills and instinct to "shoot at stuff" on the screen, sites like Stack Exchange are helping us to learn to work in a positive and cooperative way with strangers to build things that other strangers will appreciate long afterward. When a site takes the initiative to ditch the arcade mentality (see "negation-bump" below) and embrace the new "welcoming" ideas discussed in the two linked SO blogs in the question (1, 2), all kinds of positive, constructive transformations can happen. A good way forward is to stop thinking of new users as "fodder" or a resource for generating maximal score-getting answers, and instead to think of them as customers for whom you'd like to provide the best-possible first encounter experience. Instead of the insta-close and the drive-by downvoting that used to be the "right way", consider instead a helpful comment and a 24 hour period to see if the OP gets the idea, learns the best practice and self-modifies the post. Or consider just editing/improving the post for the new user if it seems like it's helpful for someone less experienced with SE. What the.. how on earth does this even come close to answering the question? The feigned indignation and outrage got the poster two comment up-votes, and made the overall experience just a teeny tiny bit less pleasant for at least several people. When some post authors look to maximize their "score" rather than to make the learning experience best for everyone, they often reach for what I call the negation bump. By saying that something is wrong, or especially that the low-rep, new user is wrong in a particularly prominent way, featuring this as the keynote point of the answer, they are often (probably subconsciously) reaching for a bump in score. First of all, the clip does not state that this problem was used, especially not used as a test for reliability. I've certainly reached for the negation-bump in the past myself, it's acquired by learning from others and having it done to one's self and finding it unpleasant. It's a small thing in the scheme of things, but it can escalate. So if you see an error in a question or a way it can be improved, you can point it out in a helpful comment, or even in some cases make an edit to the question yourself. "Saving it" for the basis of a punchline in your answer is is reaching for the negation bump. Much better to just be positive and minimize the importance of any inaccuracies in a new user's first question, but instead do whatever you can think of to make their experience both learning and enjoyable, and leave them wanting ask more and better questions. Positive reinforcement is better than negative. We have got a blog! Do we want legal questions?